Laphroaig Fèis Ile 2013: Cairdeas Port Wood Finish, truly an odd fellow of Islay. Exciting, yet a bit too weird for my taste. Still, a dram worth tasting, that's for sure. Laphroaig Cairdeas Port Wood Finish literally gives you my movie reference, The Odd Couple, with pink hue and jam combined with Laphroaig kind of smoke. Even the name Cairdeas means "friendship" in Gaelic. This whisky has two sides: it's refreshing, bringing something new to the usual Islay palate but it still is pretty odd for my taste. Just try it yourself and be the judge. Well, that's really the case with every whisky but especially with Laphroaig Cairdeas Port Wood Finish. I'm sure that anything I say about it's exciting aromas, might be the opposite of someone elses opinion. 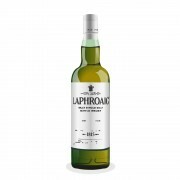 Nose: Dark fruits combined with "signature Laphroaig smoke". Raspberry jam and blood oranges clash weirdly with the rising smoke from the background. Taste: Sour citrus fruits with hints of vanilla. Sweet peat and dark red marmalade jam together nicely. Finish: Smoke and peppers take over nicely the dry citrus and red fruits. Balance: Exciting and adventurous dram with a very characteristic nose indeed. Thanks for the review. You know I've been debating getting this scotch. But after your review I think I'm going to pass. Some give this pw laphraoig high marks others like you,score it decent. Hit and miss it seems and since I only like cask strength it be a risk for me. So thanks for this review. Cheers!